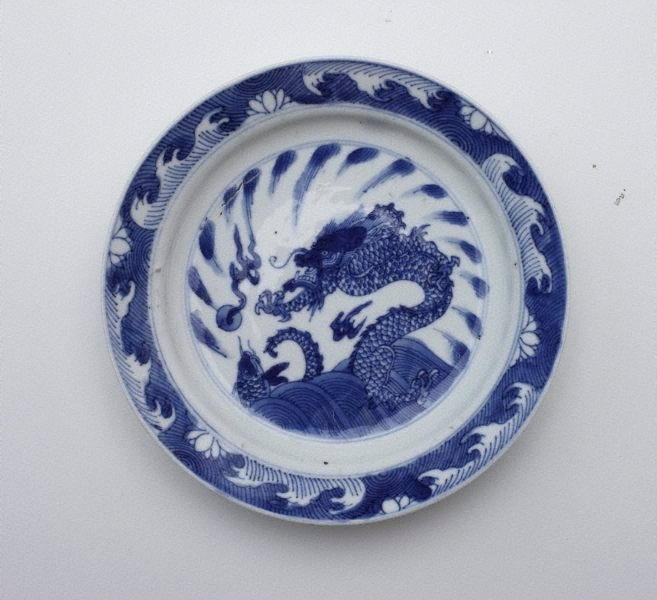 The rim of the plate is decorated with waves of water, while in the centre is a four sharp-clawed dragon fighting furiously over a flaming pearl with a carp, surrounded by splashes of water created by this battle. On the outside wall of the plate are six symbols of Buddhism. Carps in Chinese legend are often associated with dragons such as in the story of “Carps jump over the dragon gate”, in which carps become dragons after leaping over the dragon gate on the Yellow River. To this day in China, this tale is widely used to encourage young people to overcome difficulties and achieve great success.